Brush corn with canola oil and grill on a stovetop or charcoal grill on each side until slightly charred. Allow to cool and then slice off kernels into a bowl. Cut peach in half and remove pit of peach. Cut into large wedges (they don’t have to be perfect). Brush the sides of the peach with canola oil and grill on all sides until tender. Remove from heat and set aside. Brush sliced baguette with olive oil and sprinkle with salt. Toast in the oven until lightly browned and crunchy. To assemble salad, layer lettuce leaves and drizzle with olive oil. Add pieces of basil and chard corn. Tear Burrata and place around leaves. 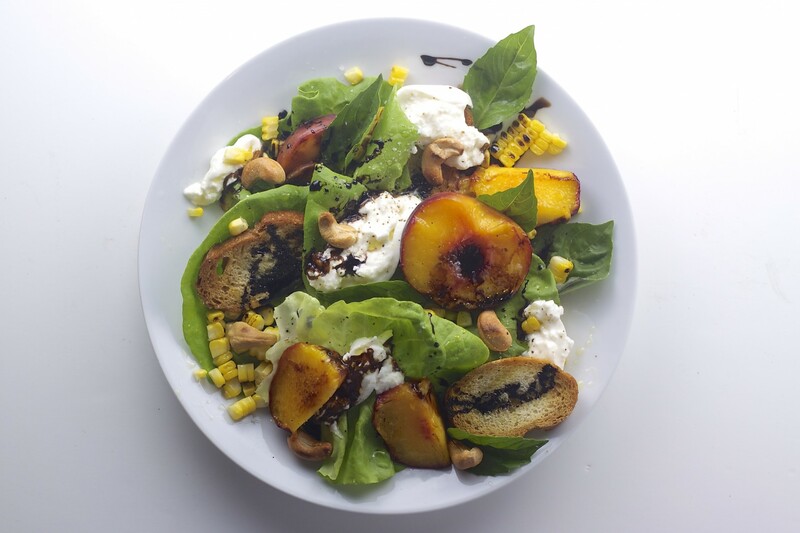 Layer with grilled peaches and add cashews and “croutons”. Drizzle with more olive oil and the balsamic reduction. Season to taste with salt and pepper.